Our artificial potted trees make stunning accents to entryways and porches, and many have pre-strung lights that create a soft, warm glow. Topiary trees are sophisticated ornamental potted styles which make beautiful additions to doorways, walkways, porches, or for use on tables or counters. Many of our topiaries, including our ivy and cypress selections, are designed specifically with Christmas in mind but with year-round decorating use. 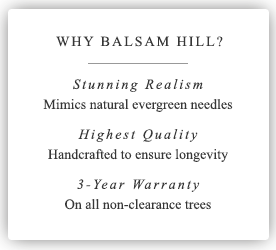 Featuring outdoor-rated lights, all Balsam Hill topiary trees will add a festive sparkle for the season and can be used both indoors and outdoors. Several of our topiary trees have full traditional Christmas tree profiles and are perfect for use as potted or entryway Christmas trees. CHRISTMAS TREE LIGHT GUIDE The top two factors to consider when making your tree merry and bright. What effect are you going for? LEDs with the warm candle-like glow of traditional lights + energy efficiency. Make the season brilliant with a festival of colors and long-lasting LEDs. Decide how easy you want to make it. With light connectors inside the trunk, just plug it into the wall and voilà. Like traditional Christmas tree lights, the pre-strung strands plug into each other.